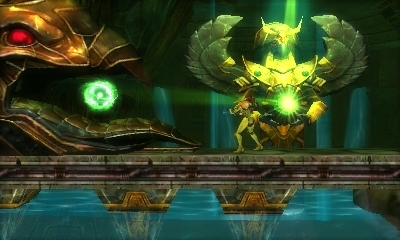 It’s a little hard to believe that it’s been 13 years since we got a proper Metroid game. The last traditional adventure in the series was 2004’s Metroid: Zero Mission, itself a sort of prequel and remake of the original NES game. Since that time, the series became more experimental, and flirted with the 3D first person shooting found in the Prime series as well as the incredibly divisive Other M. And that’s not to mention the unmentionable Federation Force, a game I still maintain doesn’t belong in the series. With Samus Returns, we got not only a return to form, but also the second intensive remake in the series. While I had played some of Metroid II: Return of Samus, the handheld adventure Samus Returns is based on, it frustrated me with several archaic design choices and hardware limitations. With Samus Returns, the experience is totally reimagined, with streamlined new mechanics as well as revamped and totally new boss encounters. The question is, does Samus Returns herald a new beginning for everyone’s favorite bounty huntress? Or should Samus curl up in a Morph Ball and power bomb the series into oblivion? The adventure begins with a brief recap of the events of the original Metroid, presented with beautiful hand drawn art. 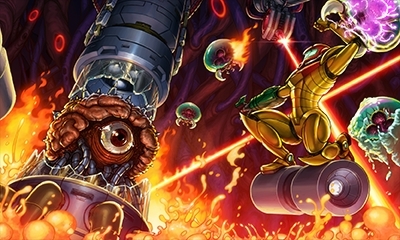 Mother Brain may have been put down, but the threat presented by the Metroids still looms large, so Samus is sent by the Federation to SR388 in order to wipe them all out. That’s all the backstory you get, and really all you need for motivation. The series has always lived or died on atmosphere, combat and exploration, and all are on plentiful display here. The game will give you little hints and nudges in the right direction, but you will mostly have to rely on your own wits to find your way through, with some small provisos. One are the Metroid altars. When you first find them, you will be notified of a certain number of Metroids you need to hunt down to lower the purple miasma and provide a route to a new area. You can also return to altars after defeating at least one Metroid to plug in their DNA and reveal the location of any nearby Metroids. 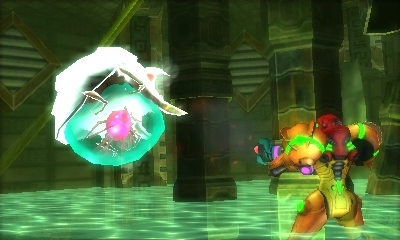 Go on Samus, just roll into the statue’s gullet to get your new Aeion ability… Totally trustworthy. The other feature that helps simplify things falls under the auspices of the brand new Aeion abilities. These work like any other upgrade, and must be first found in order to use them. There is a nice variety, ranging from tactical to combat, but the very first you get makes exploration a bit easier. This is the Scan Pulse, and it sends out a sonar pulse that reveals a bit of the map around you, as well as revealing hidden destructible blocks in your immediate vicinity. While I was worried this would make exploration too easy, I still got lost plenty of times. The Scan Pulse only serves to light your path, it doesn’t show you the way forward. Furthermore, since all Aeion abilities rely on a special meter, you won’t always have enough juice to activate them. Having said that, the Scan Pulse was always my go to ability, and the other Aeion abilities I only used when I was absolutely forced to (usually for puzzle solving). Besides the Aeion abilities, there are a number of other improvements and changes to the experience. First, and perhaps most enjoyable, is the new counter attack. By timing it just right, and waiting til an enemy is about to connect with you, you can uppercut foes with your gauntleted fist, stunning them and allowing you a moment to unleash a torrent of firepower. I admit I was initially worried about MercurySteam handling the development of the game (Lords of Shadow: Mirror of Fate was fun, though it wasn’t really the Castlevania I love), but they have more than proven their skill to me in Samus Returns. The counter could have been one note or overpowered, but I found it nuanced and fun. I appreciated you could activate it a little early and still make it work, but also liked that it wouldn’t help you much when multiple enemies swarmed you at once. Best of all, it can make boss fights a little easier, but doesn’t remove the challenge. Another nifty new feature is the free aiming. 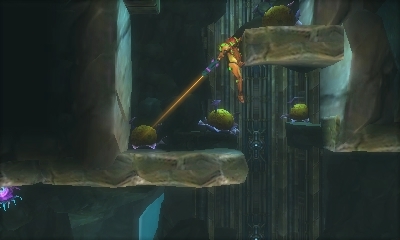 By holding the L button, you can aim your cannon in any direction, allowing Samus to snipe pesky foes with ease. Though it does occasionally become a chore to hold the L button, especially when the game requires you to also hold the R button to select missiles, overall I had few complaints. These guys aren’t so tough if you counter their attacks! While the game isn’t what I would call linear, it does offer a distinct flow. You get to a new area, are told how many Metroids to hunt, find them as well as requisite suit upgrades, kill the Metroids, then return to the altar to reveal the way forward. The one nice thing is you won’t be able to get to a new area without finding the upgrades you need to progress. So if you’re worried about getting stuck, don’t be. I feared I had missed the Grapple Beam in Area 2, and thought I needed it to get anywhere in Area 3. As it turned out, I already had the upgrades required, and was able to find an alternate route using my nifty Spider Ball. Making things a bit easier is the return of Save Pedestals. You’ll note I didn’t say Save Room, since in Samus Returns, these are found out in the open. Further differentiating them, these Save areas don’t fully heal you or replenish your ammo. Instead, you’ll find separate terminals to charge your energy, ammo and Aeion meter. Though it would have been nice to have these all in one terminal, their separation does add a bit more challenge, and encourages you to get better at countering foes, since doing so successfully rewards you with more health and ammo. Lastly, this game takes a page from Castlevania’s playbook, and offers Warp Pedestals. 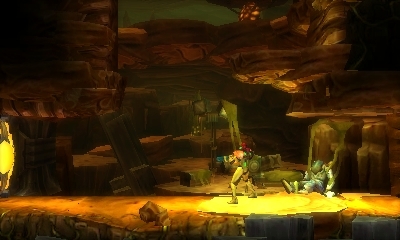 These make backtracking much less of a hassle, and I hope they show up in future 2D Metroid games.